With its 3-row seating, spacious cargo bay and handsome styling, Chevrolet's 2017 Traverse crossover SUV makes an ideal family vehicle. Although it lacks some of the driver-assist systems found on the Honda Pilot or Ford Explorer, the Traverse is still safe, competent and desirable. Solid dependable comfortable family car. I really like the size of the SUV and the third row seat. I wish my model came with the automatic trunk or push button trunk. I also with the car had a digital speedometer and the blind spot warnings on the mirror. I have had an issue with my rear brake sizing or staying compressed and wearing out the break quickly before all the others. The car has been great driving in the snow and rain. The car did ok hauling a large packed trailer although we could not push the engine to over 5000 rpms without the transmission slipping. But considering I feel the car did well for the size of the trailer even though is was in the recommended trailer size. The third row fits three kids comfortably and even 3 small to regular size adults. I really like the split seat for the second and third row seats. I really like the heated front seats but wish the back seats had heated seats as well. I really like the trunk space/storage in the floor of the trunk for keeping car supplies. Great winter driving in MN. I love that I do not have to bother worrying about getting around in Minnesota winters! Since I have had my traverse, my husband has not had to pull me out of any snow! It is a smooth ride and I trust it on long car trips. Its 3rd row seat is super helpful when we go on trips to be able to haul things like coolers, or when we are black Friday shopping to have extra storage. It gets great gas mileage and has held up well in the MN winters. The only problems I have had with it is a few times a year I have enough dirt built up in the wheel wells from living on gravel that it affects how the tires balance. Make the traverse your next family car! We love our car! We have a family of 6. And everyone fits in so comfortably we have the bucket seats in the middle row which is so wonderful for us. The car seat is in one and the other kids are able to walk between the seats to the 3rd row. We had an SUV before that has benches. It was so difficult with the car seat. Not this SUV. We just got back from Disneyland. Drove across 4 states with all the kids. The DVD player was a life saver! We live in Idaho. Winters are unforgiving. The heated seats make grocery shopping more tolerable. Love this car! 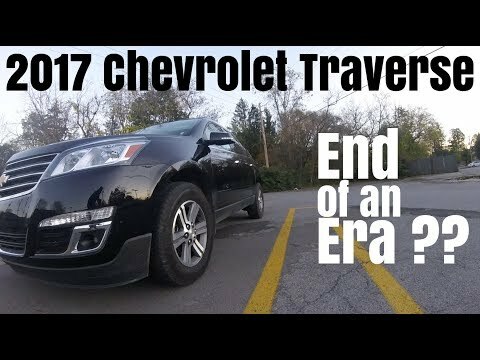 2017 Chevy Traverse 0-60 &amp; Review | End of an Era ?? ?